We left Australia leaving on a midnight flight to Bali that dropped us into Denpasar around 1:30 am. We crawled into our beds and passed out, but not before I almost used the tap water to brush my teeth, only stopping when the girl yelled out upon hearing me turn on the tap! I wasn’t used to not just using the tap water, even though I was the one who gave multiple lectures to the kids about water rules in Bali! Bali is a popular tourist destination for much of Europe, Japan and Australia. Our first night we stayed in Kuta, conveniently near the airport, but is an area which is overrun with partying Australians. It’s crowded and assaulting – every two minutes someone is asking you if you want your hair braided, or to come in their shop, or to take a taxi, or something else. The boy found this to be very sad – he perceives it as people having to beg for their livelihood, which isn’t entirely inaccurate, and he found that degree of inequality unjust. 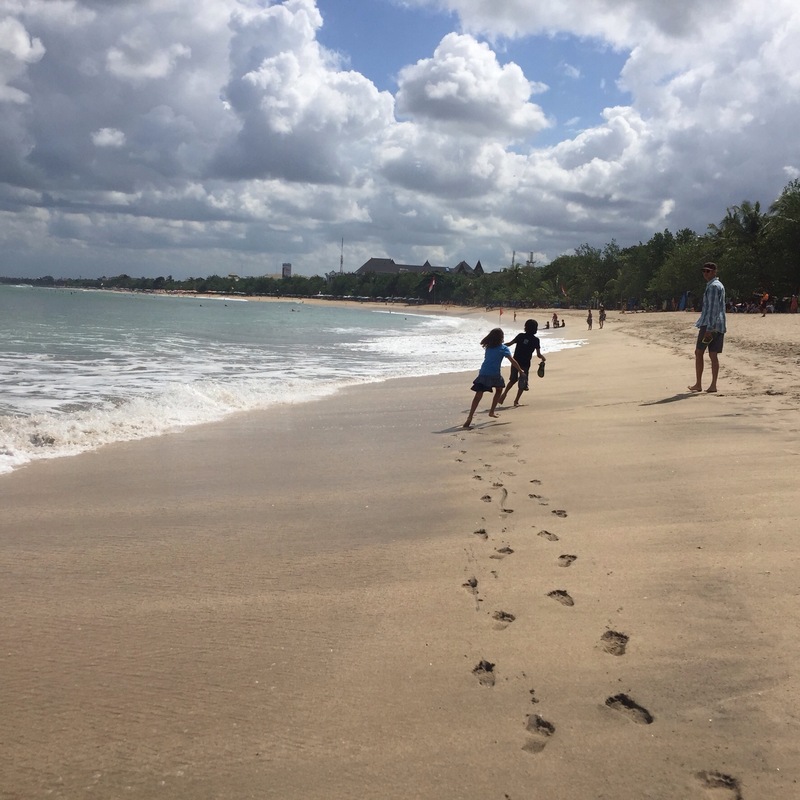 We liked walking along the beach and the kids played and jumped in the unpredictable surf, sometimes getting unexpectedly drenched and having a great time. I booked a place a little ways out of city center in the village of Tengalagang, and we were all delighted. Inang Villa, where we stayed, was a tropical oasis nestled among rice paddies and was a fantastic place to retire to after hot sweaty days of walking. Given that its surrounded by farms there is the constant daytime music of roosters crowing, ducks quacking, and the loud hum of the cicadas. At night you hear the croaking of frogs and the gentle crickets. Add to this the sound of flowing water from the stone fountains which empty into the pool, and you feel like you’re in another world here. 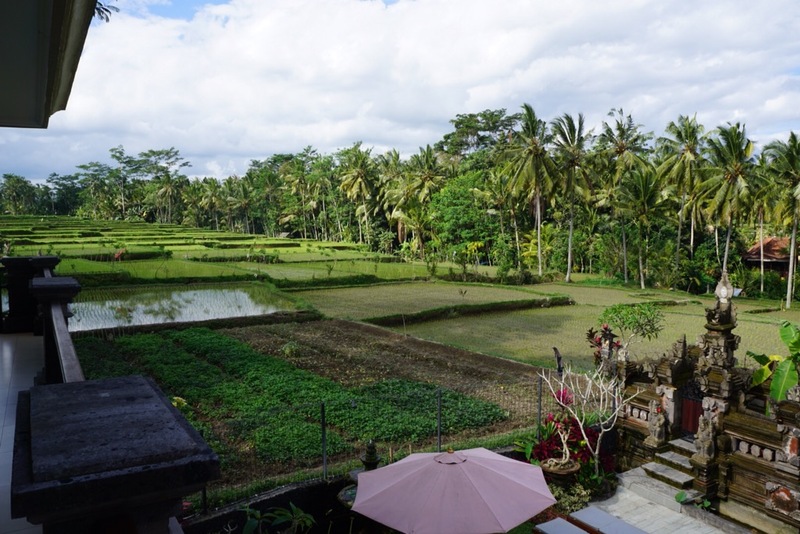 The following day we made a plan to start at the Ubud palace, walk down the aptly named Monkey Forest Road, check out the shops, visit the monkeys and then head to our spa treatments. Yes, that’s right. 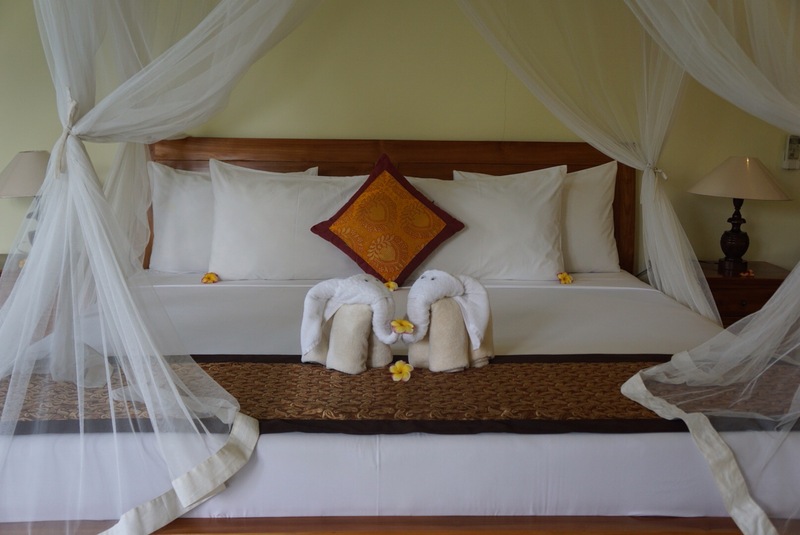 Here in Bali you can get nice treatments for next to nothing, so why not, especially after all our road time? On our way out, Kadek, our villa owner said that we should go check out the cremation that was happening. I asked if it would be okay to take pictures, and she said, “of course! That’s what most people are doing anyway!”Ah! Culture! I thought. We must go check this out. 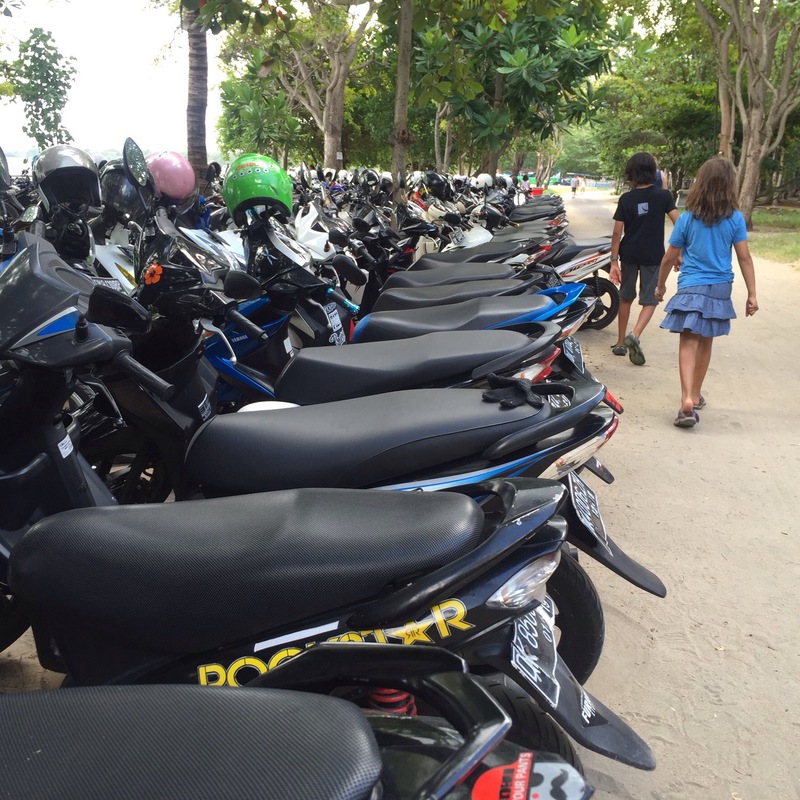 Now, while this may seem like an odd attraction, cremations in Bali are a big deal. I later learned that because cremations are very big and expensive ceremonies, communities save up money for years to afford them. The person, of course, has been dead this entire time. Upon their demise, they are wrapped in a sarong and buried in a sacred place to await exhumation for when they can be properly cremated. In our case, she marked the area of the cremation on a little map I had and told us it would start at 11:30. We didn’t get a sim card for Bali as we’re here such a short time and wifi is plentiful, but that did mean that for unguided excursions we had to just look at a map and couldn’t rely on our friend Google, and I hadn’t yet thought to take screenshots of the maps for future reference. Unfortunately, maps are not to scale here and we spent over an hour trying to find the cremation site and took what ended up being the longest route possible. Along the way we would ask people on the street “cremation?” and they would point us up the road, since everyone in the community clearly knew about the event. Theentire time the kids were googling at the roadside stores teeming with touristy souvenirs, and continually asking me if they could buy this or that. My vocal chords became worn out forming the word “No” over and over again. 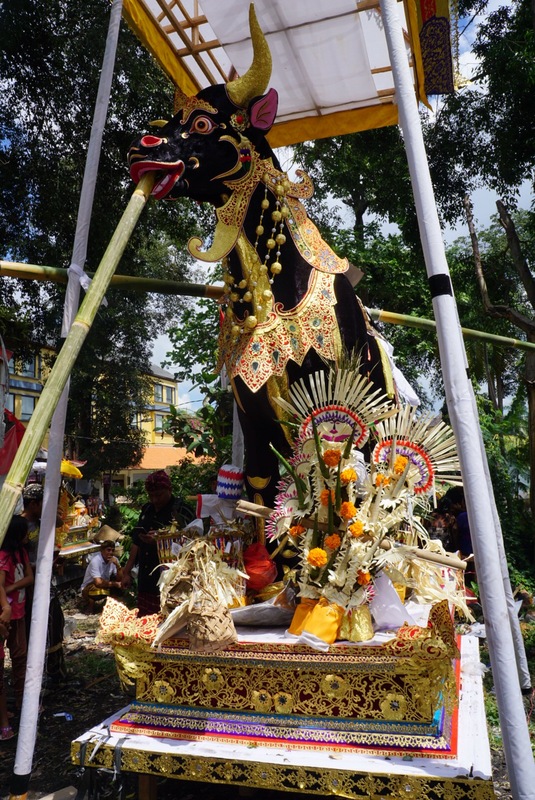 We arrived at the site tired and hungry and sweaty and only to find a confusing layout of large papier mache animals and nothing else really happening other than many dressed up Balinese taking selfies in front of them. The animals were really cool, and I suspect we would have appreciated them more had it not been for the aforementioned hungry state since I find myself struck by this picture now. The men were all dressed with a sarong on their bottom and varying shirts on top. Some were western tees with random sayings and some were natty collared shirts in a lightweight cotton. The women all had on a sarong, a tanktop, and over that a brightly colored lace top with long sleeves held shut with a long sash in a contrasting color. Given that I didn’t know what was happening and it was billed as a cremation, I did’t think it would be okay to take closeups of people in their clothes. Eric asked someone when the cremation was going to start, and they said maybe at 1pm! Thus sometimes does time run amok in nonwestern cultures! We skipped going to the monkey forest to see the cremation, and I have to say this was flop. But, I told myself, we’ll surely have time for the Monkey Forest on another day. 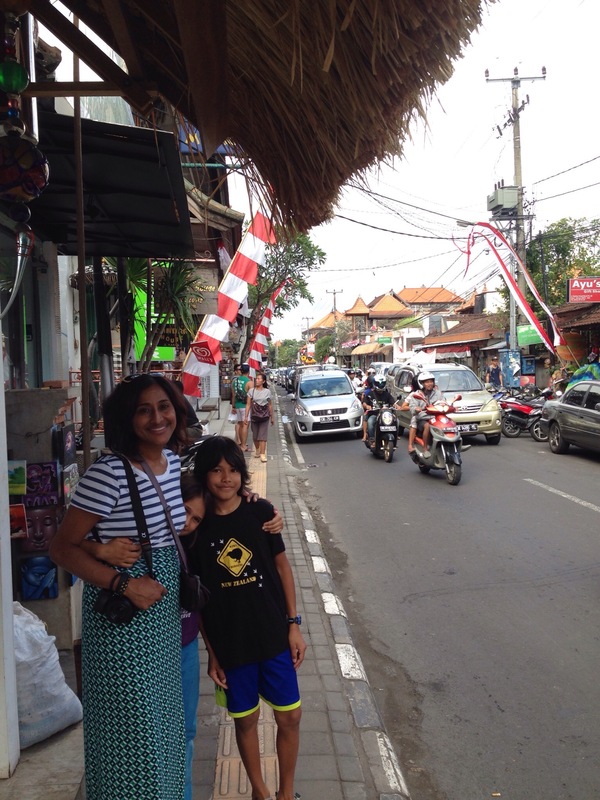 The upside was however that we had a good sense of orienting ourselves around the town of Ubud given that we walked nearly the entire way around the center. We made our way back to the main road for lunch, which was incredible. I had Nasi Champur, which is a cup of rice surrounded by veggies, tempeh, tofu, boiled curried egg and served with a cup of peanut sauce and crispy mung sprouts to mix it all together. Heaven. We made our way back to the villa for some chill time and booked a driver and tour for the next day, before going out to dinner at a small outdoor restaurant with more delicious indonesian food. This time: Mie Goreng, fried noodles with veggies and tempeh in a tasty sauce. Water and the plastic bottles it comes in are a real problem here. 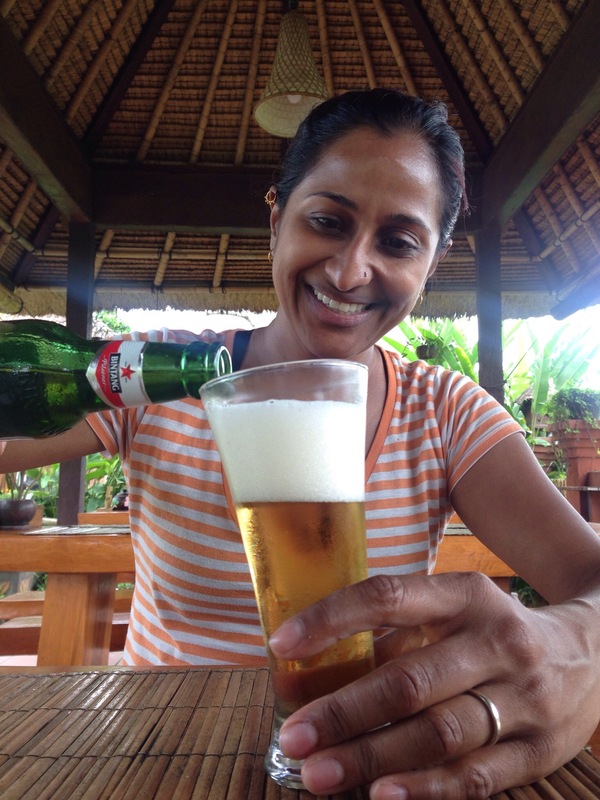 I do my part for the environment by just drinking recyclable glass bottles of Bintang beer whenever possible. We all have to make sacrifices where we must, no? You can learn a lot about a place from the people who die there! Why IS there no good Indonesian food? That sounds so delicious!! !